The first week of the 2018 NFL season has come and gone, and what an interesting week it was. Teams like the Jets, Chiefs, Buccaneers, Dolphins and Washington won outright as underdogs, while the Browns escaped week 1 without a loss for the first time in over a decade. These certainly shook up our ratings going into Week 2, and provide an interesting look into what to expect with respect to handicapping the upcoming slate. Check back weekly for college spread picks using this model (as well as other information) and check out PFF Greenline for our NFL version of the product. The Eagles escaped last Thursday with a win, despite the fact that Nick Foles was able to generate a 47.8 passer rating when clean. Tampa Bay was a surprise team in Week 1 – so the Eagles will likely have to be more explosive Sunday to keep up. Questions about the Pats’ receiving corps were answered Sunday, with Phillip Dorsett catching all seven of his targets and scoring a touchdown against the Texans. 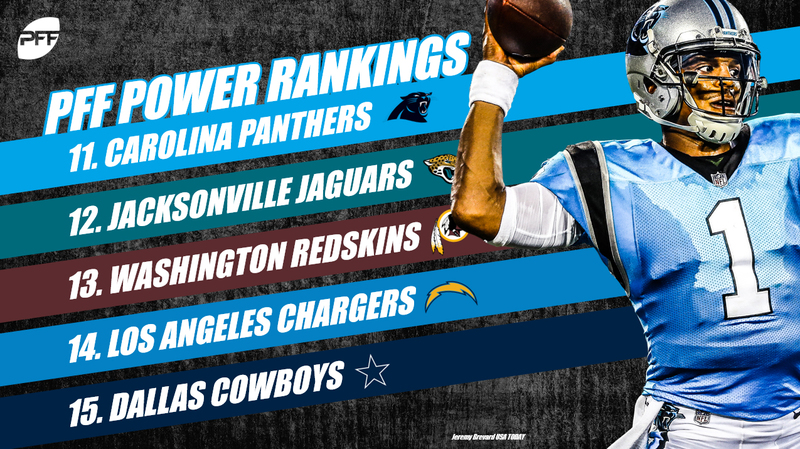 They’ll face a stiffer test in Jacksonville, a team with the league’s fourth-best defense according to our rating system. The Vikings took care of business Sunday against an upstart 49ers team by virtue of their strong play up front. Newcomer Sheldon Richardson teamed with Danielle Hunter to generate a combined 15 pressures against the 49ers at US Bank Stadium. Despite the fact that Jared Goff threw zero big-time throws Monday against the Raiders, the Rams got going offensively in the second half, generating 127 yards on a league-high 16 play-action dropbacks. The defense slammed the door on the Raiders and should have an easy time of it at home against the Cardinals this Sunday. Woof. After allowing a 14-point, fourth-quarter lead slip through their fingers, the Steelers afforded a tie to the longtime punching bag of the AFC North Sunday, in large part due to the ineffectiveness of Ben Roethlisberger, whose clean-pocket passer rating of 64.5 was in the bottom five among quarterbacks throughout Week 1. 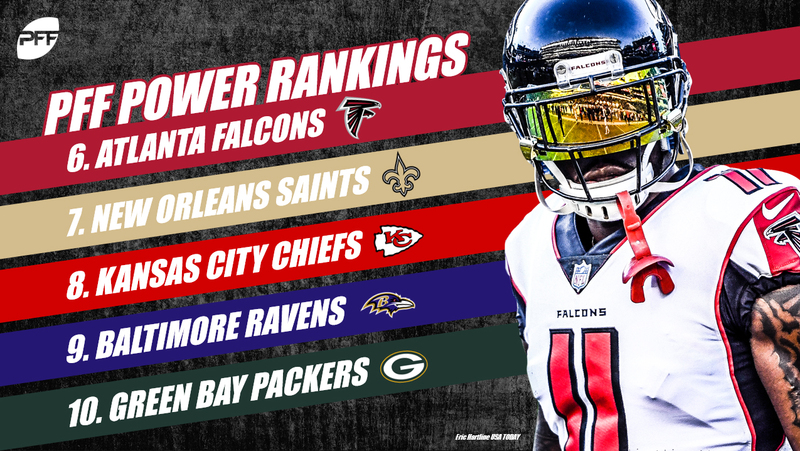 It has not been a great week for PFF’s analytical darlings, with an ugly loss in Philadelphia followed by the news that their top two defensive players, Keanu Neal and Deion Jones, would be heading to IR before Week 2’s matchup with Carolina in the dome. Their defense came out of Week 1 ranked No. 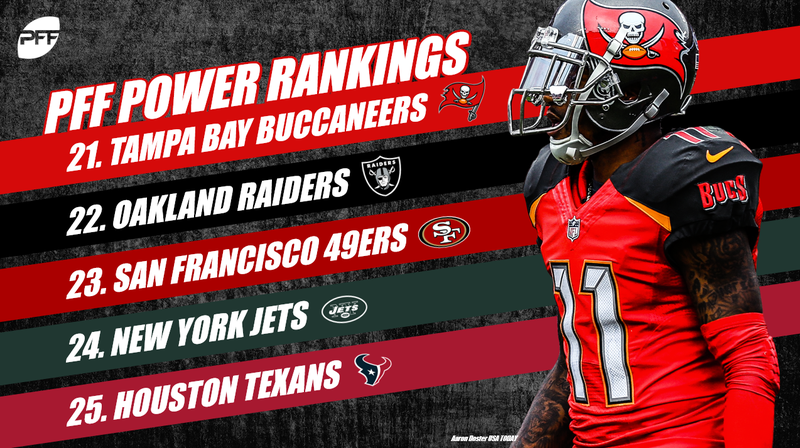 1 in our rating system, so it will be interesting to see how much of that quality they can maintain in a tough NFC South moving forward. After outside cornerbacks Marshon Lattimore and Ken Crawley were roasted to the tone of 11-of-14 for 244 yards and three touchdowns to Ryan Fitzpatrick and the Bucs, the Saints all of a sudden do not look like as good a Super Bowl pick as they were going into last weekend. The moment Chiefs fans have waited for a while came Sunday, with second-year quarterback Patrick Mahomes generating 100 yards and a touchdown on deep passes in his second career start. 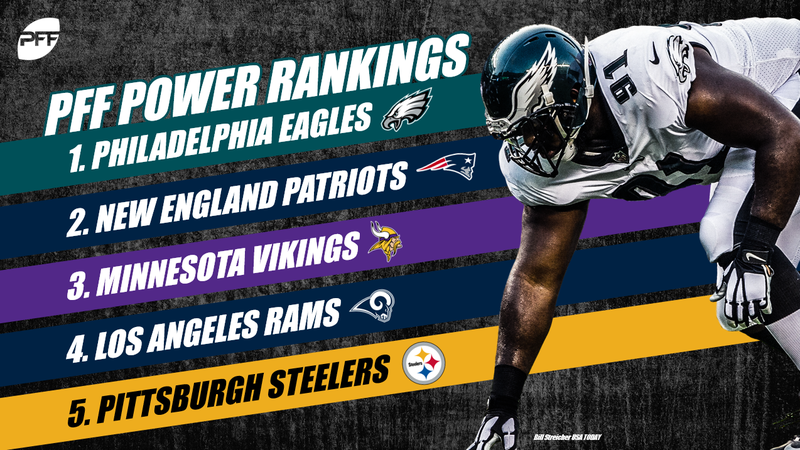 Their defense, last in our rating system, will always be a concern, however, and will need to slow a Steelers offense looking to rebound if they are to start the season 2-0 for the second-straight year. A big riser in this rating system, the Ravens handled the Bills Sunday in Baltimore, allowing zero positively-graded throws to Nathan Peterman and three total points overall. Thursday represents a big test this week as Joe Flacco will likely see pressure on more than the six dropbacks he faced in Week 1 against Geno Atkins, Carlos Dunlap and a stout Cincinnati defense. Green Bay looked destined for another season like 2017 when DeShone Kizer was throwing interception-touchdowns to Khalil Mack en route to a 20-0 deficit. But Aaron Rodgers returned, the Packers adjusted, and suddenly the Week 2 matchup between Minnesota and the Pack is one of the more compelling matchups of the young season. It wasn’t pretty, but the Panthers beat a team with a 2017 winning record Sunday, surviving 16-8 against a Dallas team that lost an average of a quarter of an expected point throwing the ball. Cam Newton, in an improvement, did not throw a turnover-worthy pass all week, and if he can continue to improve his (accuracy 73.9 percent Week 1), the Panthers might be able to upset the Falcons in Week 2 to get to 2-0. We’re a little lower on Jacksonville (again) this year, based on the continued inconsistent play of quarterback Blake Bortes, who was able to muster -0.16 expected points added on his 36 dropbacks in New York. They face a stiff test at home this week in a rematch with New England. If they win this game, we can see them shooting up these ratings moving forward. In what was the low-key most impressive beatdown of an opponent Sunday, Washington completely controlled the Cardinals on the road, allowing only a 40.0 percent early-down passing success rate, surrendering only six points, and putting up 20 points despite just one big-time throw from newly-acquired quarterback Alex Smith. Another year, another season full of Chargers shenanigans? They were proficient Sunday moving the ball, leading the AFC in early-down EPA generated in both the passing and the running game, but could not stop Kansas City from putting up 38 points themselves. Sunday will be a big test, a 10 AM start against the lowly Bills in a game they need to win, and win handily. Sunday wasn’t a good day for Dallas, as Dak Prescott failed to produce a big-time throw and dumped a quarter of an expected point per dropback, despite being accurate on 80 percent of his throws. The Giants defense is nowhere near as good as the Panthers’ defense, which should give them the chance to rebound in Week 2. Seattle played the Broncos tough Sunday, pushing a three-point spread on the road despite Russell Wilson earning a negative grade on a quarter of his dropbacks. They forced three interceptions of Case Keenum, which is not likely to be reproducible moving forward – so they’ll need to generate more than the seven total pressures they produced against Denver to sustainably win moving forward. We’re likely going to need another week to fully buy into the Bengals but Week 1 results are encouraging. Andy Dalton didn’t produce a turnover-worthy throw against the Colts, while A.J. Green was able to turn eight targets into 92 yards and a score. Thursday night will be a big test at home, but 2-0 is something achievable for the men from the Queen City. “Why is Denver lower than Seattle?” Good question. 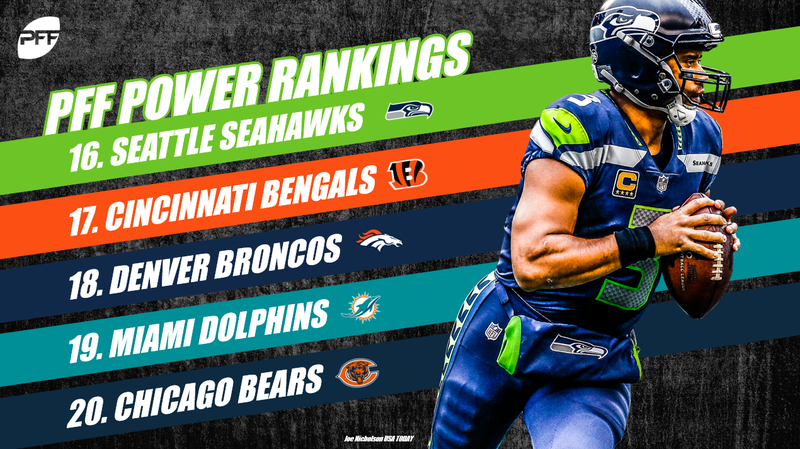 Denver was rated below Seattle in our initial ELO ratings, won a home game against them by 3 (which is roughly the home-field advantage you’d afford Denver this time of year), so we’re more or less calling that game a push. They are going to need Case Keenum to flip his 0.0 percent/7.5 percent big-time throw/turnover-worthy play ratio if John Elway is finally going to get the post-Peyton quarterback he’s been looking for. While it took seven hours, the Dolphins emerged victorious in what was a good week for the AFC East. Ryan Tannehill returned to action against the Titans and generated a positively-graded throw on over a quarter of his passes in bad weather. Their early-down passing success rate of 56 percent was very good Week 1 and will need to continue if they want to keep the Jets from going 2-0 this week. What a missed opportunity for Matt Nagy – beating the Packers in Lambeau Field in his first game would have been a big get for him. That said, it’s just one game, and they can get back on track this week against the road-weary Seahawks. If they are to do so, they’ll need Mitchell Trubisky to be more efficient, as he cost the Bears an average of -0.38 expected points added every time he dropped back Sunday night. Whew! What a start for the Ryan Fitzpatrick mini-era in Tampa. Fitz earned a positive PFF grade on a whopping 50 percent of his throws against the Saints while failing to make a turnover-worthy throw the entire game. Their defense is still a concern, as Drew Brees was accurate on over 85 percent of his passes against them, but at least they’ll be a compelling team to watch moving forward. Head coach John Gruden’s return to the sideline overshadowed an otherwise uninspiring performance from his team. Oakland’s passing game was lousy, posting the second-worst EPA in the NFL on early downs at -0.51. Cause for more concern is their passing defense was worse, allowing an EPA of 0.55 and a successful pass on 55.6 percent of attempts. These two factors have to be fixed if the Raiders are going to have any sort of success in 2018. Jimmy Garoppolo had flashes on the road against one of the best pass defenses in the league but ultimately fell short in his comeback bid. His 51.6 accuracy percentage was the third lowest in the NFL Week 1 but he did have a big-time throw on 7.9 percent of dropbacks. The 49ers struggled to get anything going on the ground posting a successful rush on only 22.7 percent of attempts but things should get much easier offensively for the 49ers going forward. The Jets had one of the most dominating performances in Week 1 rolling through Detroit on the road in Sam Darnold’s pro debut. Darnold had 30.4 percent of his dropbacks receive a positive grade and contributed .22 EPA per dropback. The Jets run defense was stifling allowing a successful run on only 33.3 percent of attempts. Deshaun Watson finished with an accuracy percentage of 59.4 in Week 1 and his -0.14 EPA on dropbacks was also concerning. With the third-highest percentage of positively-graded throws, he will continue to be very volatile throughout 2018. 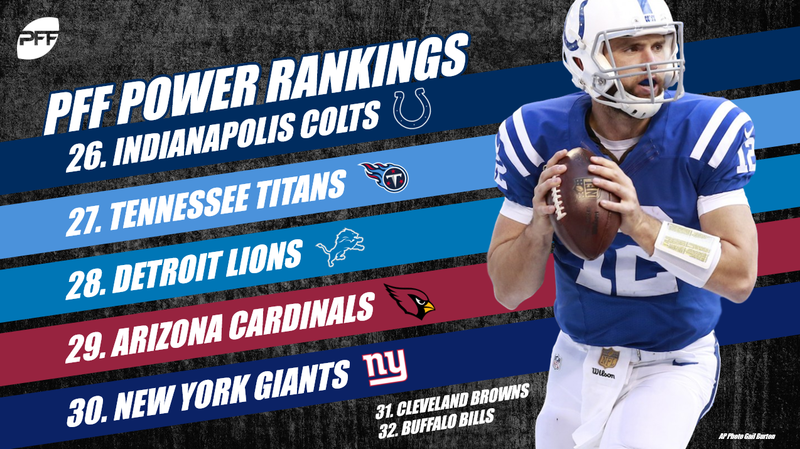 Andrew Luck made his much-anticipated comeback to the field and although he experienced a few bumps in Week 1 it was an encouraging performance to build off of. 23.2 percent of his throws were positively-graded with only 8.9 percent receiving a negative grade. In the end, it was the Colts pass defense that cost them the game allowing a successful pass on 62.9 percent of passes (highest in the AFC). In the longest game in NFL history, the Titans finally fell to the Dolphins after two lightning delays and a Marcus Mariota injury. On his small sample of 17 dropbacks, Mariota was a disaster with two turnover-worthy throws and an EPA per dropback of -0.61. Blaine Gabbert is waiting in the wings if Mariota has to miss extended time. The Lions were the biggest faller in our rankings, losing 43 points and dropping from 18th to 28th. Matthew Stafford was atrocious in Week 1 with 8.5 percent of his throws grading as turnover-worthy. It was an ugly opening for new head coach Steve Wilks and starting quarterback Sam Bradford. Their passing offense generated an EPA per dropback of -.07 while their passing defense allowed 65.5 percent of pass attempts to be deemed a success while allowing. It is shaping up to be a long season in the desert. Once in a generation talent, Saquon Barkley provided an electrifying 68-yard touchdown run, yet it wasn’t enough to overcome the Giants’ -0.46 EPA on passing attempts. Only 24.2 percent of their passing attempts were deemed a success and 30 percent of their runs were deemed a success showing once again that the offensive line has much more to do with rushing success than a talented running back. The Browns defense led them to a thrilling 21-21 tie with the Steelers. Their passing defense generated -0.55 EPA per attempt, which was the best in the NFL for Week 1. They held Antonio Brown to under 100 yards and made some late plays at the end to force the game into overtime much to the chagrin of our NFL picks. Nathan Peterman was a disaster Sunday, generating zero positively-graded throws and earning a negative grade on almost a third of his passes. Josh Allen was better, but the Bills still averaged negative EPA on his dropbacks. It will be difficult for them Sunday against a Chargers defense with talent and looking to rebound from their loss to the Chiefs in Week 1.